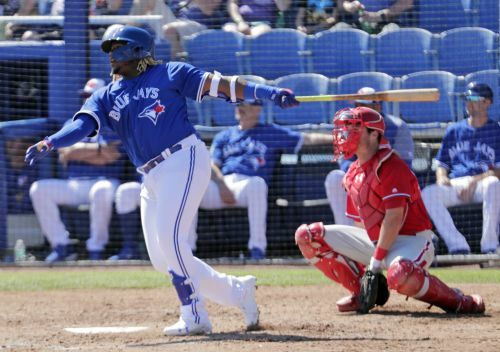 Blue Jays begin search for talent to pair with Guerrero Jr.
As for who is on the field around Guerrero when Toronto is ready to push for the playoffs again, that is what the team hopes to start figuring out this season. Just two years removed from a second consecutive AL Championship Series appearance, the Blue Jays have turned over the core of those postseason teams and started transitioning to the future. All over the diamond this season, young players will be given the opportunity to establish themselves. Besides Guerrero, several more gifted prospects are advancing through the minors. Aware that not all his talented youngsters will become productive big leaguers, Blue Jays President Mark Shapiro is hesitant to put a timeline on Toronto's return to competitiveness. "There's no limit to how quickly it can happen," Shapiro said during a conference call. "But there's also no certainty to how fast it will happen. That's why it's important to not stake it on one or two or three players. You've got to have a lot of players and a lot of players coming." Still, no single player looks likely to make a bigger impact on Toronto's fortunes than the powerful Guerrero, currently recovering from a strained left oblique. The son of a Hall of Famer, he hit .381 with 20 home runs and 77 RBIs in 91 games at Double-A and Triple-A last season. Catcher Danny Jansen, infielder Lourdes Gurriel Jr. and outfielder Billy McKinney are among the other promising players who will get their chance in Toronto this season. While success in the tough AL East won't come easy, Shapiro doesn't want his youngsters accepting defeat, either. "The expectation is we go out and compete with no limitations in our own mind," Shapiro said. Toronto's most productive batter this spring was Bo Bichette, son of former slugger Dante Bichette. A shortstop, he hit .417 with four homers in 18 games. Bichette has yet to play at Triple-A, where he'll start the season. Right-hander Marcus Stroman will start Toronto's opening day game, at home against Detroit on March 28. The MVP of Team USA's World Baseball Classic victory in 2017, Stroman had a down year in 2018, starting late because of a sore shoulder and shutting down early because of blisters. In between, he was 4-9 with a career-worst 5.54 ERA. Finally injury-free this spring, he has looked strong again. "Stroman is the right guy," manager Charlie Montoyo said. "He's pitching great." Jansen, who turns 24 in April, will get the bulk of the playing time behind the plate. A 16th round draft pick in 2013, Jansen didn't hit much in his first few minor league seasons. After being diagnosed with astigmatism, Jansen started wearing glasses before the 2017 season, when he hit .323 at three minor league levels. He played in the All-Star Futures game last summer before joining the Blue Jays in August. Pitching coach Pete Walker and third base coach Luis Rivera are the only holdovers from former manager John Gibbons' staff and the newcomers are from all over. Montoyo joined from the Rays, bench coach Dave Hudgens was with the Astros, first base coach Mike Budzinski came from Cleveland, bullpen coach Matt Buschmann worked for the Giants and hitting coach Guillermo Martinez was previously with the Cubs. "I'm excited about this new staff," outfielder Kevin Pillar said. "They come from places that all have a pedigree of winning."